New planes will mean quieter, more comfortable flights — and a lot less pollution. With quiet electric motors and the ability to take off and land vertically from rooftops and parking lots, self-flying “air taxis” like the Airbus Vahana and the Kitty Hawk Cora are being hailed as the next big thing for getting around town and to and from airports. But short hops on air taxis will be just part of a new air travel ecosystem. In coming years a new generation of electric and hybrid-electric airplanes — including “electroliners” capable of carrying 100 or more passengers — will take to the skies. Electric and hybrid-electric airplanes (which use a mix of battery and conventional power) promise some big advantages over jets and fuel-powered propeller airplanes. They’ll be much quieter for passengers and people who live near airports, and their computer-controlled, electrically driven propellers will make for smoother, more comfortable flights. And because electric motors cost less to operate and maintain than fuel-powered aircraft engines, electric airplanes could also mean lower costs for airlines and perhaps cheaper airfares for passengers. Electric and hybrid-electric airplanes would also be friendlier to the environment. With more than 40,000 flights over America each day — most by jet aircraft — air transport accounts for roughly 3 percent of annual carbon emissions in the U.S., as well as a big proportion of air pollutants like sulfur oxides and hydrocarbons. But electric planes, powered by batteries that can be recharged on the ground from the electricity grid, produce no emissions in flight. And hybrid-electric planes are designed to burn far less fuel than conventional propeller or jet planes. Because jet fuel is a very efficient way to store energy compared to even the best batteries, jets will rule the skies for years to come — especially for transoceanic and other long-haul flights. Lithium-ion batteries are getting cheaper, but they aren't getting much smaller, and inventing better batteries is a key area of research for electric aircraft developers. For now, smaller electric and hybrid-electric planes could soon be used for flight training and urban air-taxis as well as for some of the regional air routes flown today by turboprop commuter aircraft with up to 30 passenger seats. Hybrid-electric airplanes will use fuel-powered engines and batteries to drive electric propellers, or use electrically driven propellers alongside conventional turboprop or jet engines. Though hybrids don’t do away with fuel entirely, their electric motors facilitate designs that are impossible for planes with fuel-powered engines alone, says Dr. Richard Anderson, a professor of aerospace engineering at Embry-Riddle Aeronautical University in Daytona Beach, Florida. For example, hybrid aircraft could have dozens of electric propellers distributed along a wing for aerodynamic efficiency, or to make vertical takeoffs and landings like a helicopter (but with much less noise). Boeing-backed Zunum Aero, based in Kirkland, Washington, is working on a 12-seat hybrid-electric commuter aircraft to take wing in the early 2020s, with a 50-seater to follow at the end of the decade. Airbus is working on a 19-seat hybrid aircraft for the 2020s, and has more distant plans for a 100-seat hybrid-electric electro-liner. Based on the N3-X concept from NASA, the plane would use an advanced aerodynamic design driven by rows of electric “thrusters." 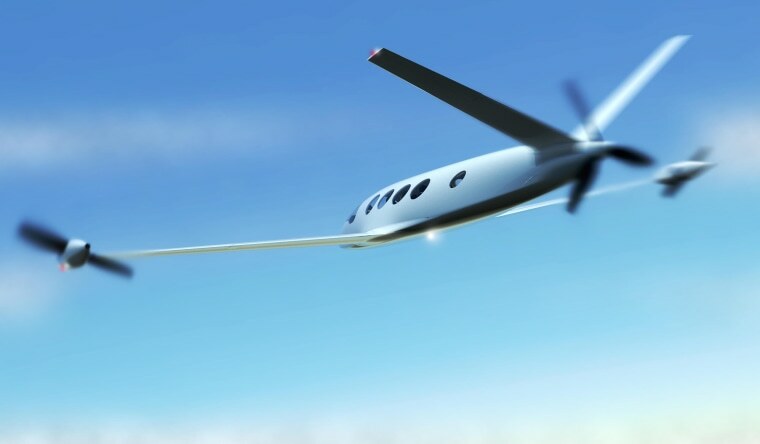 Among the first all-electric commuter planes to enter service will be the “Alice” nine-seater that is being developed by Israeli start-up Eviation. The company aims to have its first Alice in commercial service with a partner airline in 2021 as a replacement for single-engine piston-driven or turboprop planes on regional routes. The battery-powered plane will have a range of about 650 miles but is expected to cost at least four times less per passenger-mile — and, of course, will produce no emissions. The company says Alice will give passengers an unusually smooth ride, thanks to the computer-controlled electric propellers on its wingtips. “We're harvesting the same kind of beautiful stability that you see in a drone flight, controlling it roughly 400 times a second, in the cruise,” says Eviation CEO Omer Bar-Yohay. Alice will be able to fly without pilots when no passengers are onboard — for cargo flights, for example, or to reposition the plane for its next scheduled flight, according to Eviation. That could be a boon for airlines, which often face “deadhead” costs associated with moving empty planes and aircrew to where they are needed along their routes. Other aircraft manufacturers are moving forward with electric planes, including Los Angeles startup Wright Electric. In partnership with the U.K. budget airline EasyJet, it hopes to have a 180-seat electric airliner flying routes of up to 300 miles — but not until 2027.